Montecristo is an undisputed choice as one of the world’s most recognizable cigar brands. It was first introduced in Cuba in 1935, as Alonso Menéndez was inspired by the factory roller’s preferred reading—The Count of Montecristo. As with many other prominent Cuban cigar brands, Montecristo was seized by Cuban government and the nationalization of private industry in 1960. This left Menéndez and his business partner José García to flee the country, eventually re-establishing their brands (Montecristo being the most notable) in the Dominican Republic. Montecristo has continued as both a Cuban and Dominican cigar brand to this day, with the Dominican business introducing a host of updates and blends to suit most every palate. This was perhaps most apparent with the introduction of Monte by Montecristo in 2013, offering a modern take on the classic Montecristo name by showcasing a fuller-bodied, spicy blend and updated packaging. 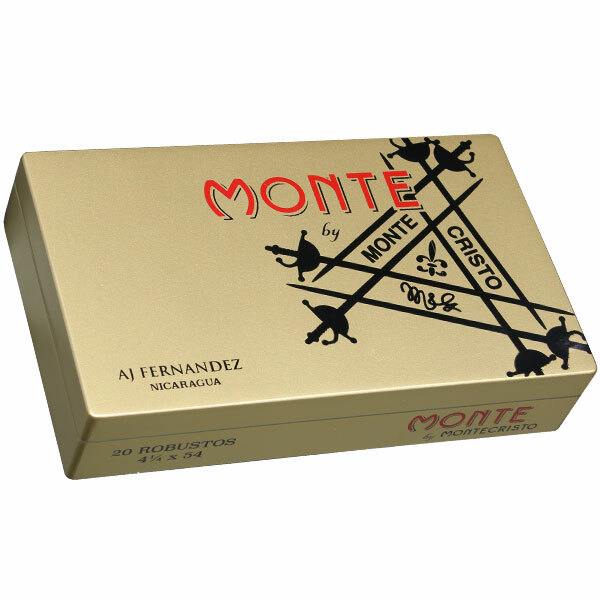 Montecristo now takes this concept a step further with Monte by Montecristo AJ Fernandez, where the brand has partnered with industry legend Abdel J. Fernandez to showcase a truly dynamic collaboration. Monte by Montecristo AJ Fernandez showcases a medium to full-bodied experience, utilizing Criollo ‘98 and Piloto Cubano Dominican fillers, a Corojo ‘98 binder, and a Dark Ecuadorian Habano wrapper as the finishing touch. The cigars are produced in AJ’s revered Tabacalera A.J. Fernandez Cigars de Nicaragua factory in Estelí, bringing a superior construction and a truly memorable smoking experience. Expect a classic profile at the cigar’s core, which has been amped up with zesty notes of spice and freshly roasted coffee. The cigars manage to harmonize flavor, strength, and complexity in a way that does this historic brand justice!